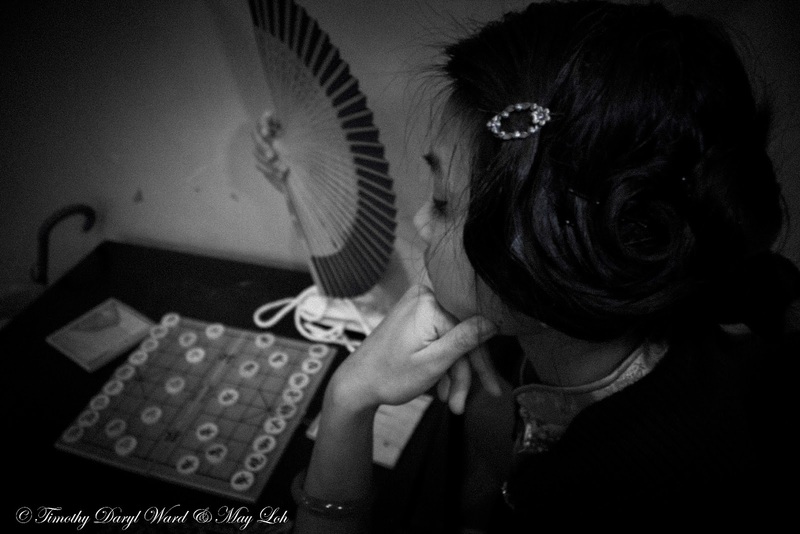 Qipao Love: Part 4 ~ Tailoring the Qipao.....a dress made for the female form! 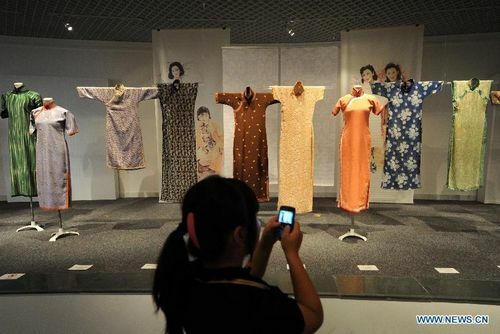 Collection of Qi Pao displayed in China Silk Museum in Hangzhou, China. Thank you so much my darlings...just wanted to tell you how grateful I am for your continued support in all forms of likes, comments, shares, pins, follows and clicks...and I am utterly thrilled to continue my journey with you walking by my side in the new year of 2013! As we continue on my little passionate journey of the 'Qipao Love', I wanted to answer some questions in my mind on what makes the Qipao an exquisite piece of art, and I thought the best way to do that is probably to look at how a Qipao (or Cheongsam) is actually made. Having altered my ready made Qipao dresses by hand myself, I know it is more than a simple case of stitch according to numbers on the measuring tape, and how delicate the measurements need to be in order to accommodate room to breathe as well as a fitted shape! So this post might be interesting or useful for you talented dress making darlings...as the research I gathered disclosed some intricate details from the cutting of the fabric to the 36 different points of measurement to create the best fitting Qipao! Tailors...unsung heroes who made the Qipao! 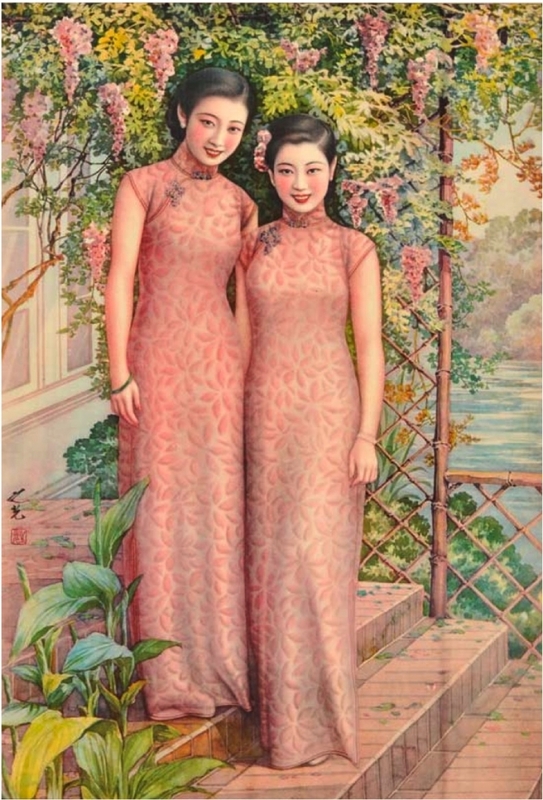 Vintage calendar girls wearing Qipao ...who were the pin-up models from 1920s to 1960s. The Qipao started being custom made by tailors for ladies of noble birth or wealthy families more than 300 years ago, since the reign of Emperor Kang Xi of the Qing Dynasty (1636), and still retains her crowning title as an exquisite garment of status..... whether the Qipao is displayed at a high society charity gala as a party dress, worn once a year during the festivities of Chinese New Year or as a traditional fully embroidered silk gown worn by the bride during her wedding..... there is something about the Qipao that lifts one's own confidence and draw awareness to one's movement in such a way that you simply have to behave as though you are an elegant lady of status. In some ways, the Qipao becomes a reflection of your inner self, personality, style and vision..... it is not merely a dress you choose to sit with or suddenly bungee jump in, it is a painted picture of how the very best of yourself will move in an ideal world. So finding a Qipao that truly fits you as the person you are becomes a crucial part of wearing the Qipao...for me, the Qipao also becomes a fuel of personal confidence, and wearing it every Chinese New Year somehow infuses me with a magic hypnotic spell of positivity that the year ahead can only get better! Today, a custom made and entirely hand-crafted Qipao requires a lengthy consultation; which can include up to 36 different and detailed measurements to get the perfect fit as well as the selection of fabric, design or pattern to compliment the wearer...may be a service reserved for the wealthy or for highly special occasions. But simple made to fit or altered quality pieces with limitations to the number of styles or designs one can choose, can still be ordered in stores or online shops from a designer label price tag of about £140 onwards. The Rui Fu Xiang Silk store in Beijing, China. Famous Qipao tailor, 94 year old Master Chu! Even more impressive...is the 94 year old tailor Master Chu Hongsheng who began his apprenticeship at the tender age of 16 and has made the Qipao for almost 80 years. His Qipao shop 'HanYi' on the Street of Eternal Happiness in Shanghai, China, has become one of the most famous places to shop for a custom made Qipao...the reason? Well...Master Chu is actually the tailor who made those amazingly beautiful Qipao dresses worn by lead actress Maggie Cheung in the movie; 'In the Mood for Love'. I would definitely recommend you have a listen of his interview (on the podcast below or through the link), as the stories he tells are truly heartwarming and really transports you back in time to get a flavour of old Shanghai Qipao glamour in the 1930s! Though the Qipao is no longer worn as a daily dress, there has been an influx of appreciation in recent years and I have even discovered a dedicated Qipao club in Shanghai...which would be a bit of a dream come true for me had I lived there, as you darlings might remember me saying that I would like to set up my very own 'Qipao Tea Club' one day! On the 20th May 2012 over 2000 ladies proudly wore their Qipao dresses to attend the fifth annual gathering of the 'Shanghai Cheongsam Salon' at the Shanghai Oriental Arts Centre in China. The 'Shanghai Cheongsam Salon' is a club founded by Ms Wang Weiyu in 2007 because of her love of the Qipao and a desire to promote as well as share the elegant etiquette of wearing a Qipao. Being a devout admirer of the Qipao, Ms Wang has over 52 Qipao dresses including a special altered one with a back slit for when she goes cycling and would like to see the Qipao being worn more often by women today. The club has a Culture Centre in the Xuhui district of Shanghai where members are required to don their Qipao to join activities such as exhibitions, flower arrangement, tea or dance performances, and they also run external events such as lectures or cultural afternoons to an increasing public audience. The modern styled Qipao has developed from the traditional Mandarin collar to Western influenced 'V' or 'U' shaped collars, bare backs, mini lengths, full skirts and jeans fabric to attract a younger generation. The new interest in the Qipao partly due to recent years of artistic cinematography with the Qipao as a focus has also inspired students to put their own stamp on this traditional dress. After the release of the movie 'Snow Flower and the Secret Fan', a student called Zhou Jingjing was inspired to create the old written Nu Shu script into her Qipao designs (Link: mag.womenofchina.com.cn/html/womenofchina/report/146875-1.htm). Hope you vintage loving darlings have found this post interesting, or even useful for those who want to make your very own Qipao! I shall head back to my embroidery hoop to work on a little project that I hope to reveal to you some time during Chinese New Year...have a fabulous weekend my darlings! For my 1920s inspired Qipao (Cheongsam) look...please take a look at Part 3 of the 'Qipao Love: All About Qipao' post! Hello May! What an interesting post! My parents were in Pekin on their honeymoon. It was in the 70's but my mum bought some vintage garments, one of them was a silk blouse. As far as I know, it could have been inspired by Qipao dress. Thank you my dear! :) I would love to see your post on the 70s silk blouse...that would be brilliant! I shall try my best if I can be of any help. Thank you for the sweet comment Tanya! Glad you enjoyed this post and I hope you will be able to recover that beloved 80s dress someday! Definitely...its one of the reasons why I love the Qipao! Also the beauty of the dress! There is so much history and elaborate details on a qipao. To make a good qipao will cost a lot. And I can already imagine hw many you have in your wardrobe :) Will always support u <3 even in 2013. I had very little knowledge (or even the name) about Qipao. I have Chinese friends who look so elegant when they wear them for events but I just look like I am in costume in them. I have always thought they were so beautiful though! Glad you like the Qipao my dear! If my 'Qipao Tea Club' idea ever takes off, then you should most certainly try to don a Qipao and join the club! I am sure you will be able to make the look your own with some vintage tweaks...its actually one of the reasons why I started the Qipao Love series of posts...I wanted to change the fancy costume stereotype and give ideas on how it can be more wearable! Thanks for following my blog lovely! This is such a great, informative post! I was born in Singapore so growing up, my friends wore versions of the Qipao and Cheong Sam to events and to school on Racial Harmony Day. I especially like the one that the model on the far left on the subway is wearing! The Qipao Tea Club sounds like a marvellous idea! By the way, I was wondering if you are planning to do a post on how to wear/accessorise the qipao? Been finding it difficult to figure what might work! Thank you so much for your Quipao love series. It means so much to me. I always saw these dresses, and loved them. Being a plus size American woman of causcian descent, I never seemed to find one that fits. Years ago I found a lovely one at a thrift store that was way to big, and had it altered to fit me. I then wore it to a black tie formal event where I got tons of compliments. Unfortunately, the culture where I live here in the US has become such that for me as a white woman wearing a Qipao is a bit controversial. I've been reading various blog posts that talk about cultural appropriation and many American Chinese comminities here may be offended by me wearing one. I can't help but think they have a point. For people to take something as beautiful as a Quipao from another culture they don't understand can lead to them wearing it in a way that might be disrespectful, cheapening, or perhaps make a mockery out of it. This is absolutely the last thing I want to do. I love the Quipao! And want so badly to wear it! Most people make one point very clear, only wear it if you can do so respectfully and not from a place of ignorance, or for the novelty of it; be educated about the Qipao. So that is where your Qipao love series has been so special to me. Because of your work I feel I can truly be educated and truly appreciate her. You have shown so much about what this article is, how it should be treated, how to wear it respectfully, etc. This is so important for a person like me who loves the Qipao, but doesn't have the background to know how to be proper with it. Thank you so much. I haven't downed my beloved Qipao, and probably won't for a while until I can be sure I am not offending my community. If there is a local Qipao tea club here, of if there is a way I can join and partake of yours while I am here in California, let me know! I would love to do that. Also, if you have any advice for women in my siduation, who want to wear the Qipao, but don't want to offend others through cultural appropriation, please let me know. For example, I've been looking to buy more online, and I found one retailer who even marketed a lovely full-length dragon and Phoenix pattern as "a great Halloween costume! Complete with a mask and chopsticks!" I quickly steered clear because I didn't want to buy something that was a costume, or marketed as a costume. I guess my biggest fear is accidentally choosing a style, enclosure, or pattern that is to costumey or stereotypical. Is there anything you think I should avoid to ensure this? Again thank you so much, your page here has given me the hope of being able to wear the lovely and stunning Qipao again.